Many of us enjoy container gardens as creative focal points in our landscape. But, have you considered going a step further and having your container garden contribute to your kitchen? There are many great edible garden ideas for your containers! 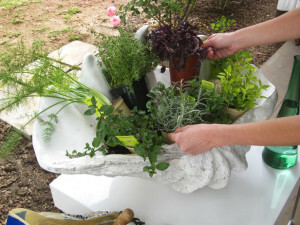 A popular idea is a container herb garden. Whether a collection of your favorite herbs go together into one large container (like below), or you create a collection individual pots, this is an easy kitchen garden, even for the novice gardener. Remember, herbs need full sun for best performance. Place your containers in locations that receive at least eight hours of direct sun. Also, don't give your herbs too much love. Avoid the fertilizer; most herbs will give you the strongest fragrance and flavor if they're grown in lean soil. Likewise, water wisely; while most herbs prefer dry conditions, some need more moisture to thrive. Use a soil-less potting mix to provide excellent drainage and space for roots to grow. Another fun edible idea is a salad container garden. Often several brightly colored lettuce varieties come as a mix in one seed packet. Or, if you are not interested is starting from seed, many garden centers now have a salad mix in 4- or 6-cell packs, for easy planting. “Mesclun” means mix and can include arugula, lettuce, endive and chervil. Many salad mixes include greens, like arugula, that have a tangy taste and add unique flavor. Red and dark green types generally are higher in nutrients and antioxidants. Some varieties are identified as heat tolerant and these may be good choices for container gardening. Lettuce can be picked leaf by leaf almost from the time the first one emerges. If the lettuce starts to “bolt” (sends up a stalk and goes to seed) the leaves tend to be bitter, so remove any plants that start to bolt to enjoy the best flavors that your garden can provide. Pairing your lettuce container with a potted patio tomato (Tiny Tim is ready to harvest in only 45 days!) gives an instant fresh salad all summer long! Finally, keep vegetable and herb plants in mind to add interest to your floral container gardens. Here, the beautiful colors of Rainbow Swiss Chard add depth to a container of annuals. For some height and structure, add chives to the garden. Or, how about peppers? Choose from an amazing array of colors, shapes, and heat levels, from mildly spicy 'Anaheim' to searing hot 'Thai Dragon'. Among sweet peppers, try 'Ariane', an orange bell, or 'Giant Marconi', a long, red one that's great for grilling. So, when planning your container gardens over the next couple weeks, consider an "Edible Garden" this summer!